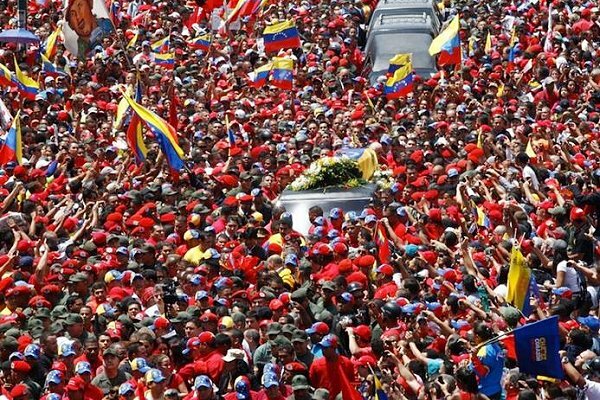 It may be difficult for North Americans to grasp the loss Venezuelans are feeling over the death of President Hugo Chávez since we have no comparable experience in our entire history. I called a friend in Venezuela today to check in with her and find out how she was doing the day after Chávez's death. She was obviously shaken. "It's a blow (golpe) and you feel it everywhere. After all, Chávez is a man we've lived with for the past fourteen years." Chávez, whatever one may think of him or how his legacy will be judged, was a warm, charismatic, down-to-earth, entertaining, larger-than-life figure, part politician, part entertainer. He was from the llano, the land of the cowboys and that was so much of his appeal. When he looked into the camera on his weekly, Alo Presidente, there was a sense of physical contact with him among viewers. I know my friend Juan seemed to feel Chávez was there with us on those Sunday mornings as he laughed with him and even hummed along when Chávez sang. It was a Sunday ritual for Chavistas to gather around the television for what Juan called "Sunday School with the Comandante." "Chávez is a teacher, just like his mother. He's a great teacher." Alo Presidente was a traveling variety show, hosted by the president, where he would sing, tell stories and reminisce about his time in the military where he served as a paratrooper, between discourses on everything from Mao or Trotsky to the newest Mission, funded by oil revenue and aimed at raising up the poor of the country. He was often accompanied by politicians, writers, musicians, internationally renowned guests, workers from the local cooperative or members of the local community council. He would offer advice, give mini-lessons in nutrition, or tell jokes as he took viewers on a tour of some remarkable local community enterprise, always with an aim to instruct and edify his audience. His face was all over the country: on billboards, the front pages of newspapers, and on the walls of businesses and homes everywhere. Indeed, my friend was right when she said Venezuelans lived with Chávez for the fourteen years he presided over the country. It was impossible to avoid him, except in the upscale districts of the cities where the rich who hated him lived. From the outside he was portrayed as an authoritarian, described as a "strongman" or a "populist" (even, completely inappropriately, a "dictator") and associated with the stereotype of the Latin American "caudillo," and there was the slightest bit of truth to this. He was opinionated, even "stubborn" and had no patience for those who disagreed with him. He built a top-down military structure in the United Socialist Party of Venezuela, but he also had a vision of radical democracy that he hoped would emerge in the consejos comunales (community councils) he encouraged. His humility, honesty and great sense of humor made up for his bluster, lack of diplomacy, and apparent arrogance. It may seem strange to attribute to Chávez the trait of "humility" but I never knew of another world leader who would appear on national television to admit he had been wrong in some previous appearance, apologize for an error, and correct himself publicly. The complex contradictions of his personality came from his humble origins in cowboy country, where independence is as much a virtue as community service, and they endeared him to the majority of Venezuelans. "We love Chávez because he thinks like us," said one campesino friend in Mérida. "Everybody says we think like him. No, no. That's backwards. He thinks like us!" His public manner was almost embarrassingly intimate. During his final appearance before Venezuelans on December 8, as he prepared to announce his return to Cuba for more treatment, he began by introducing his cabinet. After greeting his "friends," all the Venezuelans, he said "you know it's not my style to come to you on Saturday night, much less at this hour, at 9:30." Then, turning to Diosdado Cabello to his right, he continued," You remember that movie, Diosdado?" Diosdado: "Which one?" Chavez: "Yes. Fever for Saturday night. John Travolta. I danced the lambada. So did [Minister] Yadira [Cordova]. Chavez: "We danced the lambada. I recall that movie had a great impact..."
And so it continued. In a moment announcing what many already recognized to be a very grave situation, Chávez couldn't resist a reminiscence that was almost clownish, and what a brilliant stroke! Surely he knew his diagnosis wasn't favorable, but he lightened up even his final moments before the people he represented. This is the Chávez Venezuelans will remember: not some somber, unreal, elevated figure like John Kennedy or a spiritual, otherworldly Mahatma Gandhi, but a folksy sage, almost a buffoon, but a leader, always a soldier faithful to his cause, light-hearted even in the face of death, even as he led his people on a final mission. His legacy will be debated, discussed and argued endlessly in the years to come and the more insightful will recognize it to be mixed, complicated, problematic and contradictory, like Chávez himself. As I began to reflect on that legacy with my Venezuelan friend today, she stopped me. "There will be time to analyze and reflect on Chavez and those he's left in charge, but right now I don't think that's appropriate. Right now we just need to mourn." So as Venezuela mourns the passing of a great national, and international, leader, a teacher who educated a nation, one truth will be repeated countless times in some form or another: "Chavez is the people;" "we are all Chávez." And it's true. After all, when you live with a man day after day for fourteen years, you will eventually even begin to look like him. Clifton Ross is co-editor with Marcy Rein of the forthcoming book, "Until the Rulers Obey: Voices from Latin American Social Movements," due out in November with PM Press. He can be reached at clifross1(at)yahoo.com.